The NordicTrack C 990 Treadmill is ON SALE! One of our team members owns an earlier version of the NordicTrack C 990 and has been very impressed with the performance and durability. After three years, his only maintenance requirement was to occasionally lubricate the belt. NordicTrack has always had one of the best values at the $999 price range. Not only is the C 990 a relatively durable machine, but it also out-specs the competition in key components like motor, deck, rollers, and programming. Recent upgrades include longer warranty coverage, improved shock absorption, more programs, steeper incline, an enhanced console/display, and iFit Live compatibility. This impressive package makes the C 990 the most popular NordicTrack treadmill and the #1 selling treadmill at $999. MID-WEEK SALE ENDS THURSDAY: The NordicTrack C990 is priced at $1599 with Free Shipping. Financing is Available! 3.0 Continuous Duty HP Motor — This is the largest motor you will find at this price range. It will easily handle the strains of running or the stress of steep incline training. NordicTrack focuses on building motors that are fail safe with low noise immunity. There is a reason that it comes with a lifetime warranty – there are rarely any service issues. 20″ x 60″ Running Surface — This is the longest running surface you will find at $999. It is an ideal length for the long stride of runners and taller individuals. 2.5″ Rollers — These are the largest rollers you will find on a treadmill at this price. Larger rollers have more surface area in contact with the treadbelt. In addition to reduced slippage, large rollers reduce wear on the belt, motor, and bearings by reducing rotations. The larger rollers also reduce the noise level. 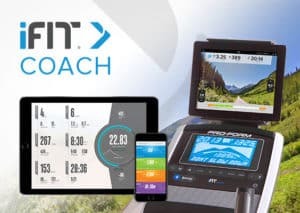 iFit Coach Ready — iFit Live was released in 2012 and it has changed the concept of merely running in place. 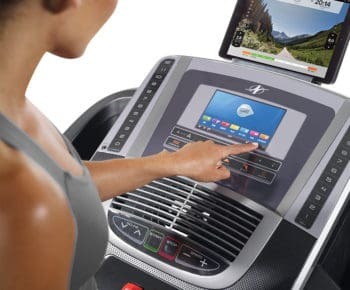 It allows your treadmill and computer to communicate through Wi-Fi. This is how it works: You create a profile and define your fitness goals at iFit.com. Through your Wi-Fi, iFit will download personalized workouts from fitness trainers like Jillian Michaels. These programs control the speed and incline of your treadmill and provide motivational audio coaching. The workouts are also designed to be progressive in order to attain your fitness goals. Your progress is tracked and available online. With your iFit.com account, you also get a nutrition and activity tracker, motivating text messages and emails, and workout videos available for download. In addition, through Google Maps you can simulate exercising on trails throughout the world. With the use of your smart device placed on the console, you can define a route on Google Maps, and your treadmill will simulate the terrain by adjusting the incline. Furthermore, you can get a street, map, or satellite view as you run the route. Our team has tested this feature by mapping a route in a local neighborhood and we were impressed with the system. iFit Live also includes an HD video library of world famous terrains. These video courses were filmed by real people sent out to record runs on popular mountain trails and ocean front walks. Like Google Maps, the treadmill will simulate the terrain as you run. The major downside to the entire iFit Live system is that it requires an addition subscription cost. Some of the competitors have similar quality programs that are available for free. Note: Some of NordicTrack’s machines priced over $1499 require you to buy a 1-year subscription of iFit Coach Plus with your machine. The C990 is NOT one of those machines. You can choose to purchase the machine without any iFit Live subscription if you wish! In fact, it comes with a 1-year iFit Membership for FREE! Learn more here. 12% Incline —With the NordicTrack C 990, you can get up to a heart pounding 12% incline. Adjustable Shock Absorption Deck — The C 990 deck reduces impact and stress to your joints through the FlexSelect Cushioning system. It consists of a series of rubber grommets designed to absorb the shock of your impact while providing an energy return at the lift-off. They claim the energy return design allows you to work out longer however we have no independent research to verify that claim. Still, you are able to adjust the shock absorption by turning the grommets. The C 990 has three grommets on each side, allowing for a better distribution of shock absorption. Their cheaper models only have two per side. 32 Installed Workout Programs — We’ve all heard the term “Variety is the Spice of Life”. Well, it can also be effective in reaching our fitness goals. The NordicTrack C 990 has 32 programs — 8 high intensity, 8 speed, 8 incline, or 8 calorie-burn. This is a generous selection of challenges. NordicTrack C990 Console with 7″ Web-Enabled Touchscreen and Integrated Tablet Holder. Console, Display & Tablet Holder — It is clear that some thought was put into the design and layout of this console. It is easy to navigate into workout programs and quick-press buttons are available for speed and incline. The machine has a 7″ Smart HD Touchscreen with a tablet holder above the console. Speakers and MP3 Input — NordicTrack has always offered some of the best speaker systems built into a treadmill console. It won’t have the quality of a home entertainment system, but it is not bad. Folding Treadmill — They list the NordicTrack C 990 as a folding treadmill. However, at 260 lbs. this is not the kind of treadmill you will want to fold and move regularly. It takes a bit of effort to fold-up and more effort to move about. It should be noted that at 260 lbs. this is a very solid and stable machine. It may be the heaviest $999 treadmill on the market. Wireless Hear Rate Monitoring — You can use a wireless heart rate monitor chest strap to track your heart rate without having to hold the grips. Console Fan — It was interesting to learn from NordicTrack that this is one of their most popular features. They designed the fan to point directly at your core so you get the best results for cooling down. It also automatically increases the airflow with the speed of the treadmill. Warranty — Lifetime Frame & Motor, 3 yrs Parts and 1 yr Labor coverage. Personal Experiences — When you assemble the C 990 at some points you will probably need two people. Allow a couple of hours. Also, the free delivery is only to the curb. Sometimes the delivery company will show up in a smaller vehicle and may drop it off at your garage, but don’t count on it. Considering the weight, you will need some hefty individuals or a hand cart to move it indoors. Otherwise, consider the indoor delivery option. NordicTrack’s parent company, Icon Fitness, is the largest fitness equipment manufacturer in the world and they are able to offer more for less. The NordicTrack C 990 treadmill is a perfect example. It out-specs the competition when it comes to deck size motor, programs, rollers and console features. In addition, you get one of the most innovative concepts in cardio training — iFit Live. We’ve talked to a lot of fitness equipment companies, and they often are in awe of how Icon Fitness can offer so much for so little. These companies are scrambling to compete. 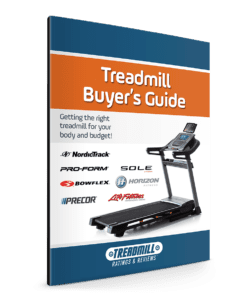 There are other treadmills at $999 that are as durable as the NordicTrack C 990, but none offer as much overall value. Check out a comparison chart of all the NordicTrack models here. The purchase process was painless and efficient. Product came when promised – setup was straightforward with included instructions. I wanted a treadmill to replace the old one. The NordicTrack treadmill is better than expected, feels solid and has a lower impact on my feet and knees – very pleased with my choice. I weigh 230 lbs. and this treadmill doesn’t even budge when I run. The shock absorbing deck is excellent for those prone to shin splints, and everyone in my family loves this. I still lift at a gym, but from now on, my cardio will be at home on what absolutely feels like a gym-quality commercial treadmill. Can you input your weight without signing up with iFit? How does the treadmill know your weight in order to figure out calories burned? My NordicTrack C990 treadmill heart rate monitor isn’t working correctly, gives a huge difference in readings which are not possible. Is there a way that I could correct, reset it or recalibrate it. You may want to reach out to Nordic Track customer service as they can help.